I have something new for you guys. Just as I weave in spiritual nourishment from the Akashic Records for my clients along with their nutritional protocols, I’ve been opening the records for insights into my own personal work and life, including retreat planning and writing. (If you want to know more about what the Akashic Records + readings are and how I use them, check out this previous post). Our health and nourishment come from so much more than our food, and I have found that if we can tap into these various aspects of nourishment, it allows for your body to use food and plants as medicine in an even deeper and more profound way! This month I was inspired to start sharing these readings in a monthly column... check out my musings below and let me know what you think! Alone in the forest we are not... surrounded by living trees, creeks, rolling meadow - it’s all so quiet and peaceful. But something, you sense, is stirring. You feel uneasy, unsettled, and know there is something there. A flash of fur caught in the corner of our view... a gentle and majestic bear emerges from the forest and calls you forth. What you seek is within, she says. It’s time to pause from looking outside of yourself for answers, the answer lies within. When we tap into our natural inner wild woman and nourish her, feed her what she desires and needs to flourish, we gain access to the parts of ourselves that are the most ancient, wise and healing. Shifting your biology starts within, too. Our thoughts inform our biology, behaviors & experiences. Same brain activity --> activates same brain circuitry --> reproduces the same brain chemistry --> affects body chemistry in same way --> same chemistry signals same genes in same ways --> same gene expression creates the samhe proteins (building blocks of cells and life) which keeps the body the same. So, same thoughts => same biology, same health, same life. Are you hurting? Seeking? Healing? Bear says it’s time to connect and cultivate your intuitive knowing. Call upon Bear medicine, she says, sing for it, call for it! I am here! Most of my readings are filled with visuals, symbols, and metaphorical storytelling, so I often seek further clarification afterward from teachers and texts, and google of course, to help deepen my understanding of what was shown to me. I started this reading off focused on my upcoming Feeding Your Wild retreat, but it became clear this was a message for a larger audience in this time. According to Ted Andrews (Animal Speak) and Ina Woolcott, Bear medicine teaches us introspection, aiding us to digest our experiences and to discover that we have within ourselves the answers to all our questions. The catch is that we must tune in: slow down and listen to what our intuition, our inner knowing voice is telling us. This often requires us to be with just ourselves at times, so you can be yourself and are able to uncover your own answers to whatever challenge you are facing. The bear has lunar symbology giving ties to the subconscious and even unconscious mind. The bear teaches us how to go within to find the resources necessary for survival, and draw upon all of your inner stores of energy and essence even those which have never been tapped or accessed. Andrews tells us that meditating and working with bear will help you to go within your soul’s den your inner sanctum to find your answers. The female bear gives birth to the cubs during their heavy sleep - semi-hibernation stages! 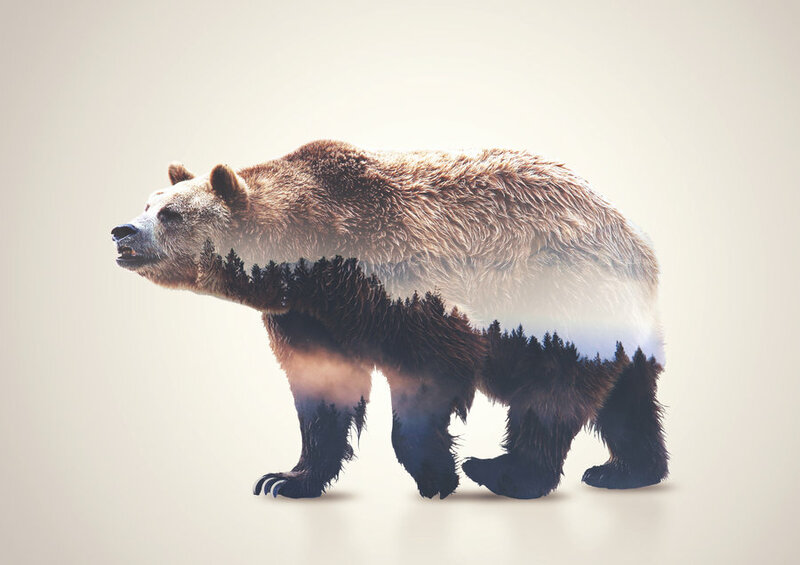 This is why Bear is also seen as a symbol of the deepest inner wisdom, of the dreamtime, transformation, and trust in ourselves and Mother Earth who nurtures us. This is a state of surrender and receptivity. As we delve deep into our identities and lose our egos, going back to our primal and elemental natures, we find we are connected to all that is - all of life, Universe, and spirit. Of course, this must be done in cycles, so just like Bear you need to know when to come out of ‘hibernation’ and to interact with others! What’s waiting to be discovered, nurtured, and birthed from within you? At the Feeding Your Wild Women’s retreat Oct 19 - Oct 22, 2017, we’ll be diving into the deepest parts of ourselves, connecting with nature and one another on amazing sacred healing lands, and learning some powerful healing techniques through food + nature... I’m SO PUMPED about this event because it’s an opportunity for all of us to begin nourishing ALL parts of ourselves. By connecting to our inner wild and wise woman in this way, we can begin to know + integrate the “right” foods for our unique bodies, minds, and souls. We would love to have you! Click here to learn more + apply!